This is Ryunosuke Kamiki. Besides being a terrific actor, he’s also excellent at live-action versions of anime and manga characters. The 23 year-old has an impressive list of acting credits, and he’s often appeared big screen adaptations of popular manga and anime, such as 2015's wonderful Bakuman movie. 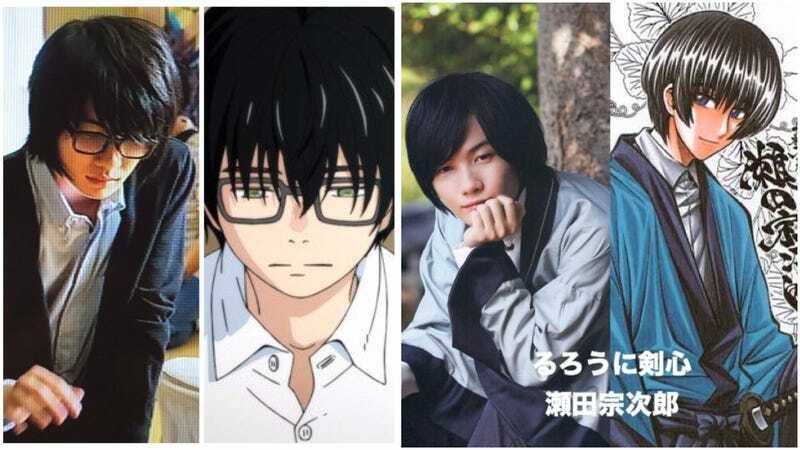 Kamiki is also starring in the upcoming live-action March Comes in Like a Lion as Rei Kiriyama and in the JoJo’s Bizarre Adventure movie as Koichi Hirose. Via Twicolle and Twitter user kamikki555, here are comparisons between Kamiki and the characters he’s brought to life. Fun fact: Kamiki’s voice acting credits are also impressive. He began working while still a child, voicing Boh in Spirited Away and Markl in Howl’s Moving Castle. He’s also voiced Kenji in Summer Wars, Sho in Arrietty, and most recently, Taki in the smash hit Your Name.